Why worry? Trump has a history of promising contributions, then not paying. June this yr. NY sued his charity for using the money he collected for Veterans in Iowa for business expenses. I'm did 3 tours in Viet Nam and resent that. 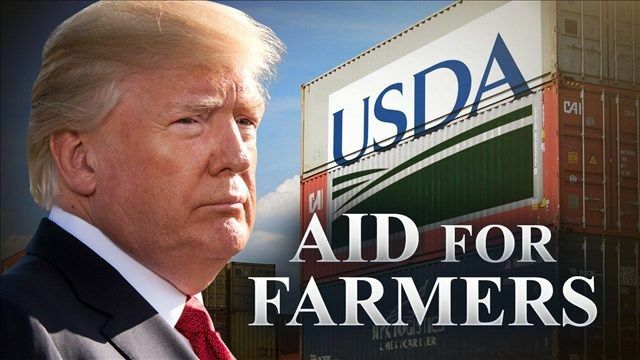 Also, why should he use taxpayers money to reimburse the large number of farmers who put him in office, when then he screwed them with tariffs that affect their markets? Is he buying future votes with my money? I resent that too. He promised to protect DACA folks, now proposes to end the program. He promised to protect LGBTQQ citizens, then screwed them (sorry for the pun). We citizens should treat each other with respect even when we disagree. We are all just trying to care for our families, be good citizens and have a bit of fun along the way. I would punish my own children for the name-calling, insults and lies he uses daily. Sorry if you're a confirmed believer but did you expect a supposed multi-billionaire real estate developer to ride to the rescue of "the little people"? Why not simply increase the soybean loan price from current rate up to $10 per bushel..? It could be implemented in one day. It would provide quick meaningful cashflow to farmers. It would be easy for everyone to understand as program is already existing at a lower rate. More so, if the whole tariff issue passes in the next 9 months and prices rise above the loan rate, it would cost the government little to nothing. If not, extend loans or forfeit bushels..What am I missing as this seems like a no-brainer? Thoughts?? ARE YOU SEARCHING FOR LEGIT HACKERS? welcome to the globalhacks where skilled professional hackers who are driven by passion to make the internet a safer place and rendering proficient help to those having cyber problems. We have acquired best legit cybersecurity professionals who individually has acquired enormous exposure in the world of HACKING, trained & skilled in ?Social media hacks (facebook, twitter, instagram,snapchat) ?Email hacks ?verified PayPal account hacks ?database hack ?credit card top up ?university score upgrade ?money transfer ?binary option funds recovery. Etc. ?warning Be wary of those forgeries you see or meet on here ready to rip you of your funds. claiming to hack in few minutes stay clear of these people .The truth be told, Not everyone found here are legit hackers. Only very few ones. To identify a fake hacker, they have no solid reviews, no website, and ready to take your money without starting the job required of them. For more enquiries and help, contact: globalhacktech@gmail.com. BinaryOption.recovery@cyberservices.com. HackerOne©?LLC 2018.